As a kid, as soon as I could read, I always went to sleep with a book in my hands. As a reader, I have always hoped that my son would develop a love of reading, and an ability to go to sleep without a parent being present. Consequently, this is a moment that I will cherish for a lifetime. I can SO completely relate! It’s an incredible moment! All of mine read in bed. Teacher of the eldest remarked on his large vocabulary in first class. I suggested his bed time habit of reading an encyclopaedia might be partly responsible for the vocab. Vocabulary was not always matched by common sense. 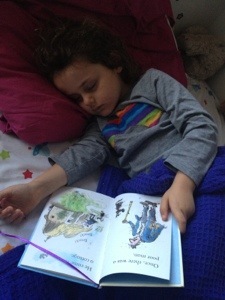 I’m still very grateful that I found him reading under the feather doona (to avoid detection). The light? A candle.